Members of the Spanish aid group Barcelona Accio Solidaria campaign for their collegues' release, December 16, 2009. Madrid, Spain (CNN) -- One of three Spanish aid workers kidnapped in Mauritania a month ago by Al Qaeda in the Islamic Maghreb (AQIM) was wounded during the abduction, the Spanish government said late Tuesday. The government said aid worker Albert Vilalta was wounded on November 29 when he, another man and a woman were kidnapped while traveling in a 13-vehicle convoy from a Barcelona aid organization. Spain's largest-circulation newspaper, El Pais, reported that 45-year-old Vilalta was shot three times in his left leg while trying to flee during the abduction, and that the government has sent medicine for him with the help of area tribal leaders. The government did not confirm those details. "Currently he is being treated for his injuries," Spain's Foreign Ministry said late Tuesday, adding that his family had been notified. The government noted that a French news report earlier Tuesday about the Spanish hostages had raised concern, prompting the government to release a statement just before midnight. Spain "had opportune knowledge about the health of Mr. Vilalta," the statement said, without specifying when the government learned about his injuries. But on December 10, the government said it considered "credible" al Qaeda's claim, at the time, that the three aid workers were in good health. AQIM audio messages claiming responsibility for the kidnappings, released on December 8 and 9, said the three were being treated in accordance with Islamic law, and vowed to free "our detainees from your jails." 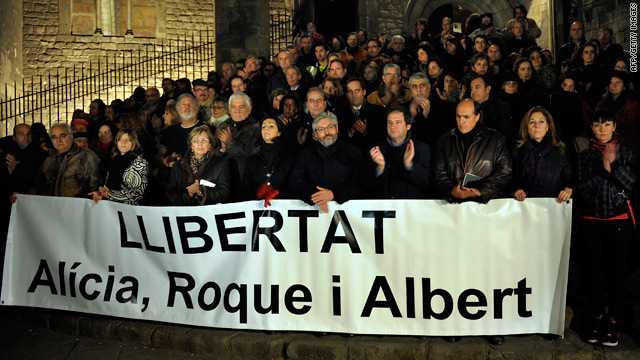 Spain's statement late Tuesday said the government continued working to free the hostages. Spain is holding dozens of Islamic militant convicts or suspects, including 14 sentenced in the Madrid train bombings in 2004 that killed 191 people. Many others are on trial or await trial. The aid workers are from the Barcelona Solidarity Action humanitarian organization. Their vehicle became separated from the rest of the convoy. Their colleagues went back to find the vehicle, which was empty, with the doors open, and with tracks from another vehicle leading into the desert, Spanish officials said. The al Qaeda message said the three Spaniards were abducted about 170 kilometers (105 miles) north of Mauritania's capital, Nouakchott, near Nouadhibou. Spain has enlisted Mauritania and Mali to help free the hostages, and Spain has sent aircraft for that effort.